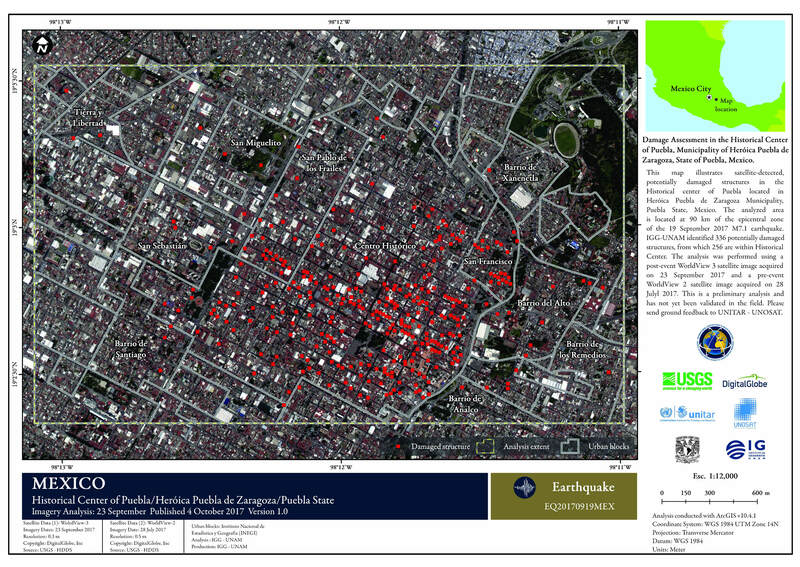 This map illustrates satellite-detected, potentially damaged structures in the Historical Center of Puebla located in Heroica Puebla de Zaragoza Municipality, Puebla State, Mexico. The analyzed area is located approximately 90 km north of the epicentral zone of the 19 September 2017 M7.1 earthquake. the Institute of Geography of the National Autonomous University of Mexico (IGG-UNAM) identified 336 potentially damaged structures from which 256 are within Historical Center. The analysis was performed using a post-event WorldView-3 satellite image acquired on 23 September 2017 and a pre-event WorldView-2 satellite image acquired on 28 July 2017. This is a preliminary analysis and has not yet been validated in the field. Please send ground feedback to UNITAR - UNOSAT.